By transforming hotels into daytime living spaces, Dayuse.com is seeking to rejig the hospitality industry. More than 5,000 hotel partners – of which 600 and counting are in the UK – have embraced the concept. Hoteliers have profited from a new source of revenue in maximising their greatest asset: their rooms. By booking their empty rooms – and even twice – during the day, they can generate pure incremental revenue. As around half of hotel rooms remain unoccupied during daytime hours, hotels are jumping onto this growing trend. The UK is now the largest market for the French-born company, with an increase of over 100 per cent in the past year both in terms of business volume and revenue. Enjoying hotels during the day has become an increasingly modern consumption trend, sought out by business professionals, travellers and trend-setting urbanites. The need for a private and secure place for just a few hours could arrive at any moment: a remote office while on the move, a respite from a never-ending layover, or a luxurious daycation. “One of the world’s most economically powerful countries, the UK is also known as a nation of early adopters who embrace novel and unique trends. “Our bold concept has been promptly adopted by connected urbanites who follow these very trends. “They see in our service both a seamless solution for travel challenges and the perfect opportunity for a day trip,” said David Lebée, founder of Dayuse.com. 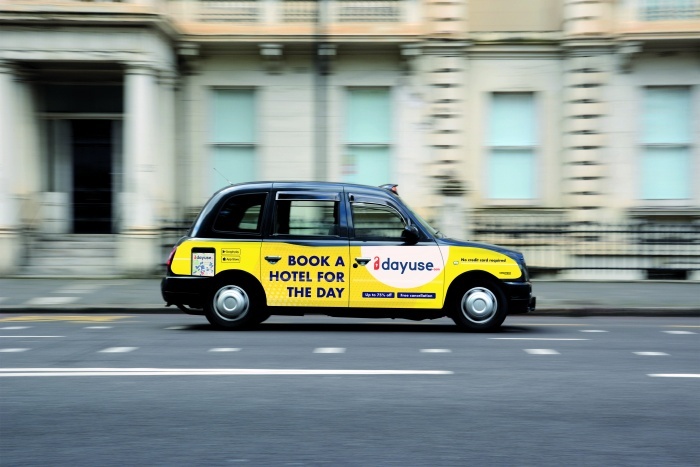 Today, Dayuse.com also announce that it has unveiled an advertising campaign across 500 black cabs in London, running until March 3rd. The move is designed to educate consumers about the possibility to book a hotel room during the day at a discounted rate. This campaign will capture the attention of both a business and leisure audience who is on the move and in close proximity to more than 250 Dayuse London hotel partners. “Deepening our investment in UK-based marketing is a key element of our 2019 strategy to generate high-quality traffic to our platform and increase our already high conversion rate. “As London remains one the most influential cities around the globe, investing in an out-of-home campaign was an obvious choice. “The iconic British black cab will provide a stylish and powerful platform to promote the brand in a unique way,” added Lebée.